Just wanted to point out there is an on-going four-way debate at Streetwise Professor‘s blog between him, commentator Michel, myself and (at times) Timothy Post. 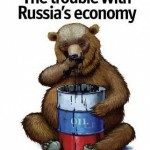 In SWP’s words, it is about “(a) the breadth of Russian prosperity, (b) its dependence on oil prices, and (c) the likely future course of oil prices” and despite the subject matter and our ideological differences, it has been generally civil and very interesting. EDIT: It’s a fast evolving situation…I find it easier to give a few more links of interest on international/Russian finance. “One Babushka Said” – Timothy Post, an “on the ground” kind of person with well-argued (optimistic) post meshing stats, personal observations and analysis. Moscow Housing, Boy, I’m Glad He Cleared That Up!, Better and Better, Information Management – Flirting with Catastrophe, The $64 Question. I Know There’s Some Leverage in There Somewhere, Human Capital, Nick Eberstadt is Not a Long Wolf*, The Price of Political Risk,The Market Price of Risk, More Generally,Roger That,Worser and Worser,If you believe that . . .,Life on a Volcano,That Was Fast,Like Minds,Hostages,The Financial Crisis in Russia Begins to Bite.